This evening, Libby asked if we could eat dinner outside. It was such a lovely evening that I couldn’t possibly refuse. And having spent a large proportion of the day outside, it seemed a shame to waste the last part of it and head straight back in afterwards. So we spent some time outside with some new books. Libby has recently started to really understand and follow stories. Which is a relief in many ways because it makes her more inclined to listen, but we do now tend to get stuck on the favourite book on repeat. New books are always welcome because opening the package always makes her willing to try a new book. And this time, we were all glad she did. The first of the two books that we read was What the Jackdaw Saw. This was written by Julia Donaldson and illustrated by Nick Sharratt in conjunction with 20 deaf young people. I do have to admit that we are a little biased towards Julia Donaldson’s books – we love them. Our favourite, controversially, isn’t the Gruffalo but the Snail and the Whale. But we haven’t yet read one that we didn’t like. What the Jackdaw Saw was the result of a workshop arranged by Life and Deaf who work with deaf young people. It’s about a Jackdaw who wanted to invite the animals to his birthday party, but they were all signing to him by touching their heads. He couldn’t work out why until he flew into a thunder storm and wondered why nobody warned him, but they had. Without ruining the story, the Jackdaw ended up learning some sign language and at the end of the book, the reader gets to learn a few signs too. This was interesting to us because both girls did sing and sign classes as babies and some of the signs are the same. We loved the book and in particular the fact that it teaches young children about sign language, a really valuable lesson I think. When I was a child, I had a friend who was deaf so deafness and sign language was just a part of life. Reading this book has made us realise that this isn’t the case for our children, so we need to make sure they understand deafness and other disabilities. The other book we read was the Giant of Jum by Elli Woollard and Benji Davies. This is a bit of a twist on Jack and the beanstalk. In fact, the giant of Jum heard all about Jack in a tale he was told by his brother. So he goes off in search of Jack when he gets hungry. Instead of eating the children he met, he does nice things for them. Eventually he does find Jack, and remembers the reason he’d gone looking for Jack in the first place. I won’t tell you the ending, but suffice to say, if ever I’m threatening to eat you, the children’s solution would work on me too. Please note, we were sent these books free of charge to review. 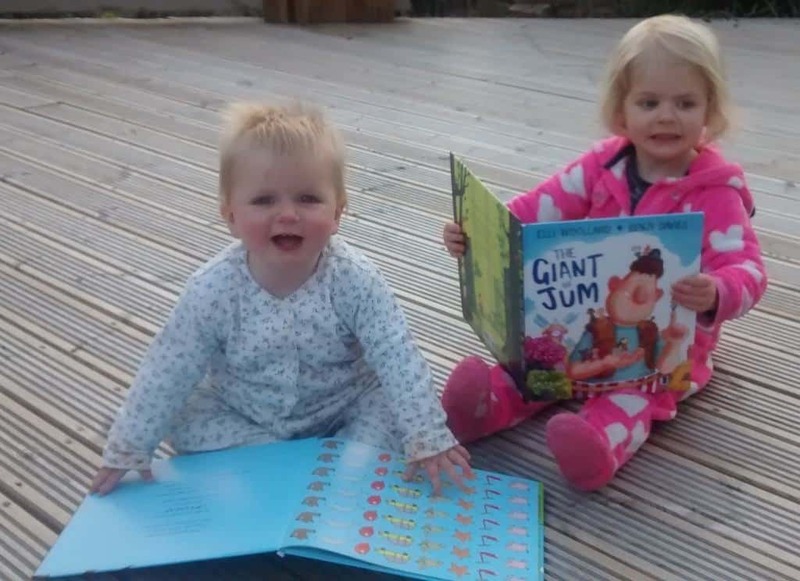 Views, opinions, grinning babies and a strange addiction to Julia Donaldson’s books are all my own.